Topics: Applicants, Client/clinic, Consulting, Testing, Training, and Physical Abilities Testing Program. advancedergonomics.com Chapter IV. 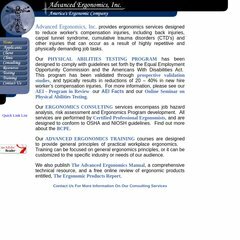 Hand Tool Design, Evaluation, and Selection - Selected ..
Advancedergonomics.com's IP address is 206.205.165.222. Its 2 nameservers are dnsprimary.external.jerratt.com, and dnssecondary.external.jerratt.com. It is hosted by Xo Communications Virginia, using Apache/2 web server. PING www. (206.205.165.222) 56(84) bytes of data.